I knit two bunnies from this fiber I bought at Sue's in Jamesport, Missouri. I knit one bunny from the Boucle Mix, and the bunny hopped across the pond to live with friends there. 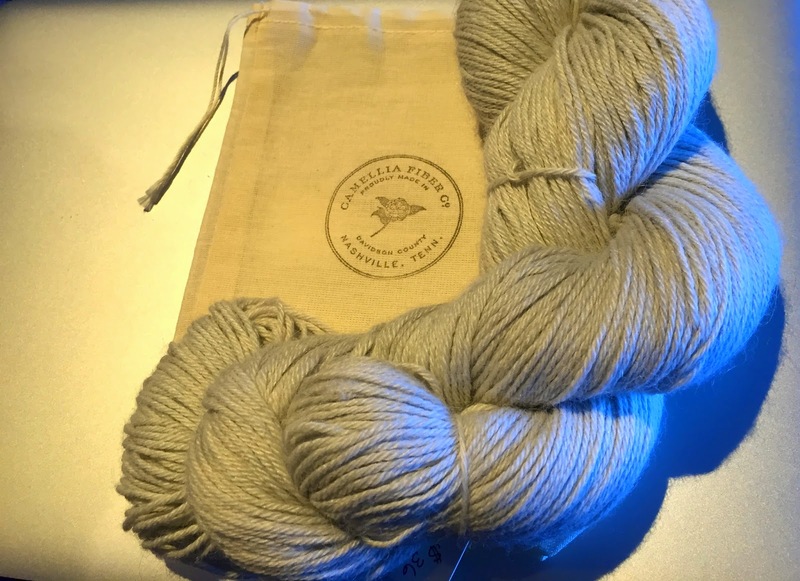 This luscious alpaca silk yarn I purchased from talented Rebekka's Camellia Fiber Co.
My youngest son and I visited Prince Edward Island in September. I had dream's of absorbing the beauty of LM Montgomery's setting for writing Anne of Green Gables. My son dreamed of playing golf. Our dreams came true! While on the island one thing neither of us had dreamed of was visiting Green Gables Alpaca Farm, but we did that, too. Tim took the photos of some of the alpaca on the farm. The alpaca were not keen on smiling for him, but rather were intent on enjoying a meal. First Try...knit 2, purl 2,....get distracted... rip out. Second Try...repeat first try...get distracted... rip out. Third Try...knit one row, purl one row...get distracted...rip out. Darling granddaughter came to visit. Grandma looked up to see her darling granddaughter waving a pair of empty knitting needles around...the very needles that had held the Fourth Try. Mercy! Darling granddaughter said she is sorry and offers to help get the stitches back on the needle. Grandma forgave her and hastens to say she will put the stitches back on the needle, then miraculously succeeds in doing so...both the forgiving and the getting the stitches back on correctly the first try! I knit and knit and knit and finished the scarf on Christmas Eve! Hooray! After Tim unwrapped the scarf he immediately modeled it for me...I spared him the harrowing tale of the scarf's birth. While I have not got the hang of spinning alpaca fiber yet, I have enjoyed knitting my first alpaca fiber projects this year, and just before Christmas I purchased 285 yards of 80%alpaca 20%silk in a logwood and iron shade that is begging me to knit something wonderful. I had another scarf in mind when I bought the fiber, but it only took 180 yards to make Tim's scarf so I am debating whether to make a longer or wider scarf or something else. Do you have any suggestions for my first alpaca project of 2015? Hi Gracie. I laughed out loud at the saga of your scarf for Tim. He looks very pleased to wear it and very handsome too! Maybe use the new yarn to knit a longer wider scarf/shawl for you to wear over your shoulders. I love the softness of alpaca and think they are such cute animals. We have several alpaca farms around here and enjoy seeing them as we drive by. We're staying in tonight instead of going to the churches party as planned because my back isn't cooperating with me at all today. My goal. It will be better to begin 2015. Blessings always my friend. Happy New Year! 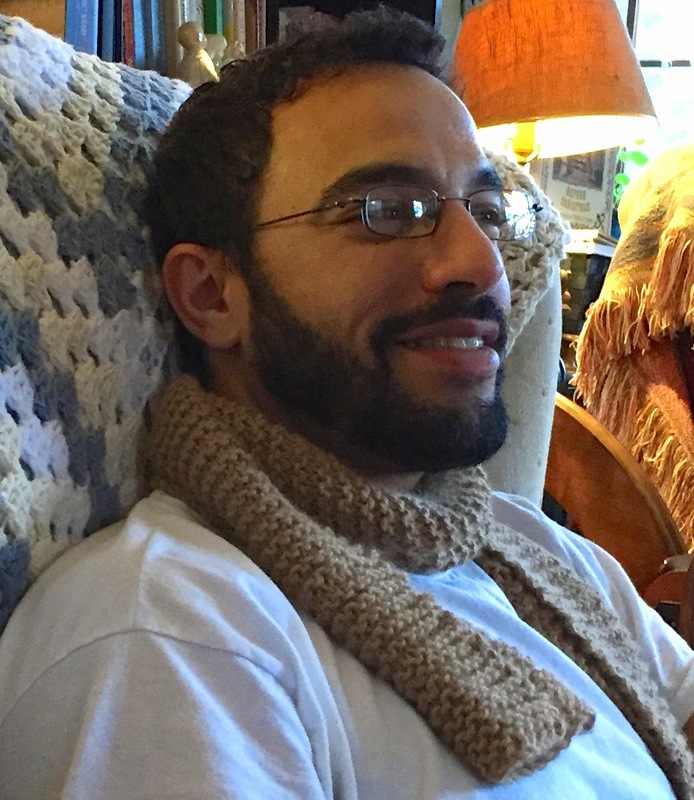 Tim looks wonderful with the scarf on and although he may not know the whole story he will feel each and every stitch that is filled with love. There are so many things you can make with that yarn, how about a scarf and a hat or mitts? I love alpaca it is so soft and dreamy. Actually I am knitting a cowl with my new alpaca yarn right now. Wishing you and your wonderful family the very best 2015 Graice. Lovely scarf, Gracie!! The yarn looks very soft. I have never tried alpaca yarn. I can just image how lovely and soft the scarf must be. A very happy new year to you. The scarf ended up looking wonderful my dear friend. 285 yards ... Hum ... You can make a cowl, a scarf, a hooded scarf ( possibly) ? And maybe a shawlette ( pimplese perhaps?) , no matter what you choose to make it will be beautiful . Happy new Year to you my ear friend. Bravo for sticking with the scarf, it has turned out beautifully! I hope you and your family have a wonderful 2015, full of happiness, peace and good health. Nice job on the scarf; sounds like it has quite the story! Enjoyed the photos of the alpacas. Great scarf and wonderful, realistic story of its creation:) Such is life is it not? Loved seeing your photos of the alpacas! Whenever we drive by an alpaca farm I am captivated by their cuteness. HAPPY NEW YEAR! !Your scarf looks great Gracie! How about knitting an alpaca shawl next? I love the story of the scarf! Especially it's near fatal accident at the hands of grand-daughter! Well saved :) I also think knit, knit, knit, knit (is that garter stitch ??) is underused, I was very much taught that the look of it is the "wrong" side, but actually, it's perfectly lovely in its own right, has a great texture. What a funny story you told of the scarf and the mishaps leading up to its eventual completion......it was well worth all those tries though! Your son makes a great model, and the scarf looks lovely and softly textured. Maybe make another scarf now, for yourself, dear Gracie, to keep you cosy! I love alpaca yarn and have been making things with an alpaca mix which is also lovely, soft amd warm and light. Wishing you happy crafty times in this new year! Amazing story! I once saw an old woman in Greece spinning directly from her goat. Don't suppose you could do that with alpaca? I have been thinking of you this Epiphany day, Gracie. My husband's father, who was Ukranian, celebrated his Christmas on Epiphany, and we think of him every year though he has been gone for 23 years now. I know you are interested in the Orthodox church, so perhaps you have had a special celebration today? In any case, a very Happy New Year to you, and a happy Epiphany! Hi Gracie - Love the story and the scarf. Your son must have been thrilled with his gift - it looks perfect on him. Enjoy this lovely, peaceful time of year. I look forward to reading more of your knitting adventures. Glad you managed to fix it, there's nothing worse than all your stitches fall off and unraveling! I LOVE knitting with alpaca. I'm just sad that so many folk in the US and the UK jumped onto the alpaca bandwagon that alpaca fibre prices have dropped, putting alpaca herds in some places at risk of destruction. The scarf is lovely, as much for the love and sentiment behind it as for the yarn and pattern. What a nice gift. Wonderful scarf, Gracie! I great first project! Glad you were able to fix the disaster, and glad you were able to get the yarn from the farm. The alpacas are very cute. Wish you all the best in your future projects!